Aaron and sons finish up their priestly ordination period in Leviticus 9-11. The tabernacle is consecrated and holy. The Lord continues to make His directions for worship very clear to Aaron and the Israelites. And then, we see that it's not aways easy to follow God's instructions when Aaron's sons, Nadab and Abihu offer unauthorized fire. In an instant of carelessness, they lose their lives. Following God isn't always easy, and sometimes we are called to make necessary judgment calls with Him in mind, in the moment. Here's where my mind keeps going from today's reading. The Lord is holy, and He wants us to be holy. So what does being holy mean for you and me? At least for me, I hear God calling me to be more and more like Him, more like Jesus. I have to continue to give Him the authority in my life, even in the "heat" of the moment. That's when I have a tendency to be most careless, like Aaron's sons Nadab and Abihu. Certainly, we are lucky we do not have to worry about sacrificing animals, thanks to Jesus. But we do have to think about ways in which we need to let go of our own, selfish ways in order to follow God and experience the fullness of His glory in our lives. Read what Jesus says on this matter of self-reflection and discernment. It's important to us as we come before God. 30 That is why many among you are weak and sick, and a number of you have fallen asleep. 31 But if we were more discerning with regard to ourselves, we would not come under such judgment. 32 Nevertheless, when we are judged in this way by the Lord, we are being disciplined so that we will not be finally condemned with the world. "More discerning with regard to myself..." I know I always have room to grow in Christ. Those on-the spot decisions I have to make are where I think I need to start. Thank You for making me holy in Christ. Forgive me for having bad judgment and forgetting to give You the authority in all that I do. I pray for Your Holy Spirit to bless me with discernment with regard to myself so that I may experience the fullness of Your glory. I pray for _______________ who also need the blessings that follow Your discernment. Moses gathers the Israelites in front of the tent of meeting in Leviticus 6-8. It's a big day. It's time to ordain Aaron and sons as priests and consecrate the tabernacle. Moses, again, follows God's instruction to a tee, and He makes all necessary offerings so that everything is holy and clean. His ability to carry out God's will is a reflection of his close relationship with God. Yesterday as I was reading, I kept thinking how blessed we are as Christians to have Jesus in our lives. He changes the way we worship God for the better. Because of Him, nothing separates us from a direct and very personal relationship with God. Even though the ceremonial offerings and rituals required for the Israelites by God seem unimaginable to me, it occurred to me that Leviticus is still very significant and applicable to the faith I have in Christ. 34 What has been done today was commanded by the Lord to make atonement for you. More than giving me a deeper appreciation for Jesus, Leviticus is an important part of God's bigger love story for His people. He is just beginning to reveal the enormity of His love at this point in His story. It's building. It's exciting to see it unfold. This part of the Bible shows that God really does know His people and their needs. He is so powerful, perfect, sacred, and holy, and He wants us to be able to draw near to Him. He wants to free us from our sins, then and now. Our God is a forgiving God full of grace, and He goes to great lengths to save us, just as He does for the Israelites. He deserves every bit of our time, energy, and respect. It's an amazing story God tells through His people. It is an honor and a blessing to be a part of it! Thank You for making me part of Your family in Christ. Thank You for including me in Your beautiful love story. Forgive my sins. Help me bring them all to You at the foot of the cross. Fill my life with Your grace and guide me in sharing Your grace with others. I pray your blessings for ___________. 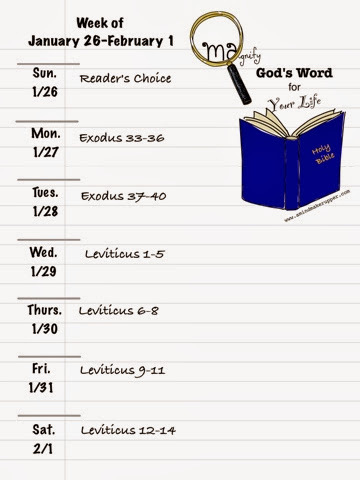 We begin the book of Leviticus, the story of God's chosen priests from the the family of Levi. It all begins with Aaron, Moses' brother, and his sons. While Exodus contained God's moral laws for His people, Leviticus 1-5, is the very beginnings of God's spiritual laws for His people. There are so many details and ceremonial rules the Israelites have to remember in order to make atonement for their sins. Worshiping God during Moses' day was very different in so many ways. It just makes me even more thankful for the Lord and Savior we have in Jesus. Today's reading helps us realize just how much Jesus frees us from our sins. We are blessed with hindsight and the saving grace of Jesus who changes how we are able worship God for eternity. Jesus is our High Priest, and He dwells in us. Because of God's love for us and Jesus blood shed for us on the cross, we do not have to worry about making ourselves "clean" enough to approach God. We don't have to go sacrifice a goat or a ram in order to be forgiven. We don't even need a priest to approach God. We can come to him with confidence. We are forgiven for our sins and inevitable short comings. Jesus did that for us for all time. What a gift! 26 Such a high priest truly meets our need—one who is holy, blameless, pure, set apart from sinners, exalted above the heavens. 27 Unlike the other high priests, he does not need to offer sacrifices day after day, first for his own sins,and then for the sins of the people. He sacrificed for their sins once for all when he offered himself. 28 For the law appoints as high priests men in all their weakness; but the oath, which came after the law, appointed the Son, who has been made perfect forever. Thank You for sending Jesus to save me by grace and not my own imperfect works. I am so grateful that I can come to You, Lord, with confidence, free from sin. You, alone, are holy. Transform me with the power of Your love. Forgive my stubborn and selfish ways. Continue to hold me in Your arms, change me, and shape me to be more like Jesus. Use me for your glory. I pray you will fill ___________ with your comfort and love today. Moses and the Israelites complete the tent of meeting and all the goes along with God's tabernacle in Exodus 37-40. Moses shows us what it looks like to not only hear God but also to follow through with His instructions down to the last detail. The ark, the table, the lamp stand, the altars for incense and burnt offerings, the basin for washing, the courtyard, the priestly garments, and final set-up of it all, all these things are under Moses tender loving care and God's direction. It's amazing to see this huge project for God come together. Today's reading is a great example of the amazing things that can be done when we are willing to follow God's call in our lives. God blesses Moses' faithfulness again and again. He has God's favor on his side. And don't we all want and need that? Moses shows us the simplicity of what it means to be faithful. 16 Moses did everything just as the Lord commanded him. Moses spends time alone with God. He listens to Him and His call. He follows His instruction, step by step. He trusts God to provide. He continues to worship God with thanksgiving. God comes through for Moses. He comes through for us too. And when we say "yes" to what God has in mind for our lives, we are able to witness and feel His powerful and glorious presence with us. 38 So the cloud of the Lord was over the tabernacle by day, and fire was in the cloud by night, in the sight of all the Israelites during all their travels. In Christ, each day is a chance to say "yes" to God and see His glory. Thank You, Lord! I thank You for Your living presence in my life. I thank You that each day with Christ is a new chance to say "yes" to Your will for me. Forgive me for all the ways, both knowingly and unknowingly, I ignore your calls to be more like Jesus in my words and deeds. Be with me, Lord, in all that I do. I want to glorify You and be a reflection of Your love to others. I pray for ________________ today. Please wrap him/her/them in Your strong loving arms. You know what he/she/they need the most. I would love for you to jump in and join me in reading! For more on this Everyday Reading Project click here. God does not hide His anger and disappointment towards the Israelites in Exodus 33-36, but He is faithful to His promise to the them in spite of their sin. Thanks to Moses pleas, and His favor with God, God has mercy on His people and decides to continue going with the Israelites on their journey to the Promised Land. God renews His covenant with His people, despite their sins. Moses spends 40 days fasting with God on Mount Sinai, and when He comes down, he has the second version of the Ten Commandments and all the direction he needs to get started in building the tabernacle. The Israelites really mess-up with God over the golden calf in yesterday's reading. Yet, God remembers His promise and doesn't go back on His Word. As a result, we get to see how true God's love really is for us. Moses responds to this terrible mess of a situation by going immediately to God. He doesn't defend himself, proclaim his own innocence, or even deny association with the Israelites. Instead, Moses shows us how we all need to approach God in humility. 13 If you are pleased with me, teach me your ways so I may know you and continue to find favor with you. Moses' humble devotion pulls on God's heartstrings, so to speak. Look at how God responds so that we get to know more about God's nature from God himself. God really loves us, even beyond our own ability or understanding. See, He is with us even after we mess-up. And I can't help but notice that for the faithful, mess-ups are a learning experience with an awesome, merciful Teacher. They are also a chance to see even more of God's glory at work in us. Thank You for being slow to anger and abounding in compassion, graciousness, love, and faithfulness for me. Forgive me for all the times and ways in which I disappoint You. Like Moses, I pray You will teach me Your ways so I may know You and continue to find favor with You. I ask that You shine Your compassion, love, and faithfulness on ____________ today. May they be uplifted by this prayer. In Exodus 29-32, Moses is still up on Mount Sinai, alone with God. Following the Ten Commandments, Moses is taking in all of God's instructions for the next steps in His journey with God and the Israelites. God doesn't leave out any details. God covers specific directions for appointing priests, making sacrifices and offerings, and building the tabernacle for worship. Moses is gone for a long time; and when he comes back down the mountain, Aaron and the Israelites have made a big mistake with a golden calf. God is right there with them. They have seen Him. They have heard Him. He has just saved them and provided for them again and again. The Israelites know it. Yet, Aaron, one of God's most faithful, the future priest of His people, and the Israelites get caught up dancing with a golden calf idol. The whole thing seems so silly. A golden calf, really? My first thought after today's reading was "How could they?" Then I thought, probably, the honest and real question is, "How could we?" After all, we are all God's children. We are not so unlike the Israelites. We all have our own "things" in our lives that have the potential to take our time and attention away from God. And if we aren't careful, before we know it, we will get caught up dancing around and losing His direction and will for us. "Things" small and big can interfere with this life saving, most important relationship we have at our fingertips. So, did you notice the great lengths God goes to in these chapters to teach Moses how His people are make atonement for their sins? There are lots of rules and procedures. That's because God knows us. He knows our imperfections. And in the days of Moses, Jesus was not here yet to free us from our inevitable sin. I am so thankful that God knows me. And even more, I am thankful that He loves me in spite of myself, just like He does the Israelites from today's reading. He loves you too. He loves us so much that He sent His own Son, Jesus, as our eternal Savior, with us always. Because of Jesus, we are free from our sin. We just have to keep our focus on Him. I thank You for knowing me in all my strengths and weaknesses and loving me completely. Thank You for Your Son, Jesus, who sets me free from my sins. Forgive me for being distracted by "things" of this world that interfere in my relationship with You. Open my heart and help me let go of those "things." I know nothing can separate me from the love of Christ. I pray for Your love to consume me. You are the only God, my Savior. To You, be glory, majesty, and all power and authority now and forever. In Exodus 25-28, Moses was up on top of Mount Sinai with God for forty days and forty nights. God speaks to Moses and gives him explicit, detailed directions for building and setting up the tabernacle, the Ark of the Covenant, and all the furnishings and accessories to go inside it. I got a little lost in the specifics of all the directions, so the visuals really helped me have a better understanding of these things. Basically, God asks Moses to lead His people in building a portable sanctuary. It's a place where God can be with the Israelites, and the Israelites can worship God as they travel through the wilderness to the Promised Land. God has something specific He wants Moses to do, so God spends a lot of time telling Moses exactly how to do it. He doesn't leave out a single detail of this big building project. This is the beginning of God physically dwelling with His people wherever they go. 9 Make this tabernacle and all its furnishings exactly like the pattern I will show you. Yesterday, I took comfort from the fact that sometimes God works through us, little by little. Well, today's reading shows us that at other times, God reveals ways He needs us to work for Him right away. So, how will we know the difference, when God needs us to wait and when He needs us to act? It's simple. He will tell us. For starters, Moses and God take time away from the noise and busyness of the Israelite crowd. They go to a secluded spot. We all need that kind of uninterrupted time with God to really know and hear the details of what He needs us to do for Him. Also, in this case, I can't help but notice that Moses does most of the listening. I think sometimes I spend way too much time talking to God about my prayers when what I really need is more time to just listen to Him. I can't possibly hear God's direction if I am the one doing all the talking. Finally, like Moses, we have to recognize God's ultimate, sovereign authority in the matters of our lives. Moses' faithfulness inspires us to do that without question. While Mount Sinai isn't in most of our backyards, we all need a place to spend time away from the hustle and bustle to be with God, to be still, and to listen to His voice. Thank You for dwelling with me. Speak to my heart. Help me to hear Your voice. I pray for Your direction today and always. I know ___________ [those on your mind] all need You to wrap them in Your loving arms. Fill them with Your peace and comfort their aching hearts with Your voice, please, Lord. May they feel uplifted by the power of this prayer. 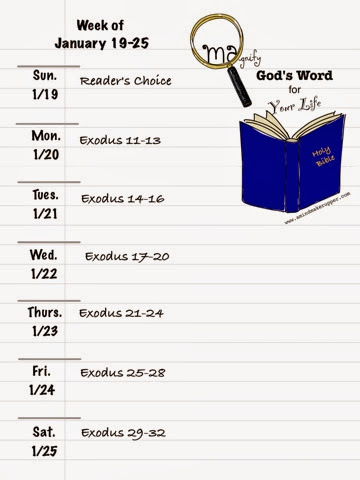 God follows up the Ten Commandments with more specifics to His laws in Exodus 21-24. He covers rules for Hebrew servants, personal injuries, stealing, social responsibilities, justice and mercy, Sabbath, and three annual festivals to remember. He wants us to thrive within the abundance of His love. God also reminds Moses of His plan to lead His people back to the Promised Land. And at the end of today's reading, Moses goes up on Mount Sinai to be alone with God for forty days and forty nights, a number that we will see again and again in the Bible. God's promises and purposes for us are overwhelmingly good and big and true. Think about His complex, detailed plan for the Israelites that is full of blessing and prosperity. It's the same for you and me. When we follow God, we may not know what lies ahead, but God does. "See, I am sending an angel ahead of you to guard you along the way and to bring you to the place I have prepared for you." When we willingly follow Him, we have His awesome protection. I find a lot of comfort in the fact that even though I get scared of the uncertainty, God is going before me and working circumstances for His purpose. "Little by little I will drive them out before you, until you have increased enough to take possession of the land." Lately, I have been catching myself in my own impatience. I know some areas of my life in which I am sure God is using me, leading me, even transforming me. He puts directions in my heart. I do my best to follow them, but in between the BIG, obvious signs of His hands working things out, I start to question what I am doing day in and day out. I wonder if I am still doing what He wants me to do. And then I came to these words today, “little by little… until” God makes His promises happen. That’s just the reminder I needed to hear. Even in my times of waiting, when it seems nothing much is happening, God is working on things at the rate at which He knows I can handle them. Sometimes that means tackling bits at a time until I am ready for the fullness of the bigger picture He has in mind. I thank You going ahead of me and preparing my way. Thank you for knowing me and loving me so much that You reveal Your plans and purposes to me at just the right times in my life. Forgive my impatience and doubts. Help me to remember that You are working things out even when I feel as though nothing much is happening. Open heart to Your voice of encouragement, especially in the little moments of my days. I pray for ________ today who really needs Your loving encouragement, Lord. In Exodus 17-20, God's people are traveling from place to place, following His direction. God is showing His awesome power to His people. And at the same time, the journey brings out lots of grumbling and frustration, and Moses continues to be in the pressure cooker as the leader. He finds the help and support he needs in God and Aaron, Joshua, and his father-in-law Jethro. And as today's reading ends, God appears to Moses and Aaron on Mount Sinai and gives His people the famous Ten Commandments. Do you know them, the Ten Commandments (Exodus 20)? Look at God go today in Exodus 14-16 as He continues leading the Israelites out of Egypt (see the map)! God has them right where He wants them, and that turns out to be terrifying for His people. They find themselves stuck in a hard spot (literally), Red Sea on one side and an angry Egyptian army on the other side. Things look terrible, but God has something special in mind. He sends His people straight through the Red Sea of all places! He rescues all the Israelites and swallows up the entire Egyptian army in the waters. And that's not all of God's glory. He continues to hear the voices of His people. He continues to provide bread and meat as they go through the dessert. There's so many reasons to praise God! God fights for us just like He fights for the Israelites. Did you catch what He says today? Pharaoh, again, refuses to listen to God in Exodus 11-14, until the last (and most horrific) plague, killing all of Egypt's firstborn sons. It's tragic, but through it all, God's wonders and power are multiplied. God honors his promise to keep His people safe. While the Egyptians are in mourning, the Israelites are celebrating the Lord's Passover for the first time under God's direction, in the comforts of their own homes. God loves His people. Even Pharaoh, with his hard heart, can tell it. And so, finally, at the end of today's reading, God leads His chosen people toward the Red Sea and their Promised Land. I want to focus on the celebration of the Lord's Passover. To this day, Jewish people commemorate this day when God freed the Israelites from slavery. But as Christians, does Passover really apply to us? In Exodus 8-10, things continue to get worse for the Egyptians, but the Pharaoh just will not listen to God. The Israelites are miserable. God promises to save them and take them from Egypt to the Promised Land. But, my goodness, the whole process seems like torture. Despite plague after plague from God, Pharaoh's heart is ridiculously hardened to God and His love for His people. Things are just as God said they would be. I can't shake Pharaoh today. Have you ever met a Pharaoh? Have you ever had to come face to face with someone whose heart is obviously hardened and desperately missing the love of God? It can be exhausting, scary, frustrating, heartbreaking. Ultimately, it's life threatening. God keeps sending signs of His might, His presence, and His power. There's a battle going on for Pharaoh and those who do not believe in God. They question God's sovereignty because the magicians distract people, making them believe that they, too, can do the same things God can do. God could take all of Egypt out in one instant, but He makes Himself very clear. He is in Egypt to tell a bigger, better story. Take a look at what God has to say to Pharaoh. 15 But when Pharaoh saw that there was relief, he hardened his heart and would not listen to Moses and Aaron, just as the Lord had said. 15 For by now I could have stretched out my hand and struck you and your people with a plague that would have wiped you off the earth. 16 But I have raised you up[a] for this very purpose, that I might show you my power and that my name might be proclaimed in all the earth. I caught myself today. I was thinking how much I can't stand that Pharaoh and how much I AM NOT like him. He bothers me, the way He disrespects God and refuses to listen. Just when I think He might finally know who God is, Pharaoh goes his own way again. Thank goodness I am not like Pharaoh, I insist to myself. Then I heard a still, small voice saying, "Wait a minute, Lindsay. Let's think about that." God has called Moses to do a really big job for Him. Moses is overwhelmed and really wishes someone else would do it. But, after much conversation with God, God makes it very clear that Moses is His man. God promises to bring His people, the Israelites, out of Egypt and back to Canaan, The Promise Land. God tells Moses exactly what to do and say, and He provides all the resources Moses needs to get the job done. Then in Exodus 5-7, we see Moses and Aaron are a faithful team as they carry out God's plan. Unfortunately for the Israelites, things with Pharaoh get a lot worse before they get better. We know God has a plan to save His people. We know He is concerned about them. We know He hears them. We know God loves them. We also have the advantage of reading the details in retrospect in the comforts of our own homes, so we know things end really well for the Israelites. But in the middle of it all, Moses is scared to death. He follows God's direction, and time and time again, we see that things don't go the way Moses would expect when, after all, he's just doing what God tells him to do. After his first attempt to speak to Pharaoh, Moses goes straight to God. He's on the verge of freaking out because things are worse now that Moses has gotten involved. 22 Moses returned to the Lord and said, “Why, Lord, why have you brought trouble on this people? Is this why you sent me? Has that every happened to you? You feel called to do something special for God, and things just don't work out the way you would have thought? Moses is right on about one thing, though, in today's reading. God is the one with whom we need to share all our doubts. Moses is getting really good at that. Take a look at how God reassures and encourages Moses in answering his questions. God reminds Moses that He IS GOD. He wants Moses, Aaron, the Israelites, and even Pharaoh and the Egyptians to know what that means. There are no limits to what He can do. He invites Moses to "watch and see." God wants to use this situation for more than just saving His people. See, the solution God is going for in this situation with Moses is not so plain and simple. And, I know that's the way God works in our lives sometimes when things don't go the way we wish they would. God thinks bigger and better than us. He wants us to really know Him, His love for us, and His mighty power. So when we find ourselves scared to death, on the verge of freaking out, like Moses, we can draw close to God. We can focus more on Him, and He will use our doubts to build our faith through the amazing things He does not only for us, but also for those around us. Thank You so much for showing me Your glory and power in my life and in the world. Help me to recognize Your presence each and every day. Forgive my doubts when things don't look good or when things get worse before they get better. Give me the courage and the faith to trust You. I pray that my relationship with You will fill me, strengthen me, and encourage others to really know and love You too. I pray today that You will be with ____________ today as he/she/they face(s) what seems like an impossible situation. To You, Lord, be the glory forever and ever.